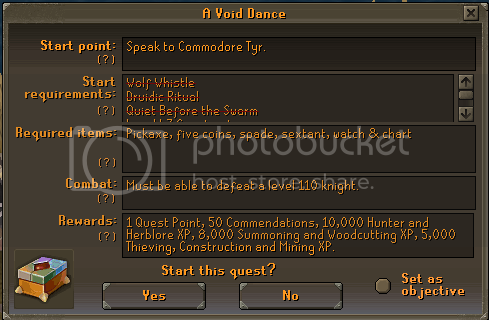 To start off this quest talk to Commondore Tyr at the Void Knights' Outpost. He'll say he needs your help to track down the pest that escaped onto the mainland. Continue to talk with Commodore Tyr and use all 3 options, and then speak with Captain Korasi, she'll instruct you to meet her at the Port Sarim docks, so take the ship back. Once you get there, you should see her standing with Jessika. She will instruct you to talk to people working around the docks to note if they have seen anything suspicious or signs of the pest and where it went. Go north from Korassi point and talk to Captain Tobias who will tell you to talk with Gerrant, the owner of the fishing store. He'll say that the creature knocked over his fishing barrels outside. Head outside and you'll notice a purple trail which hints at where the pest may be now. Start at the bush next to the fishing store. Once the trail has led to the Rusty Anchor Pub, inspect th mount, and head back to Korassi and talk with her. 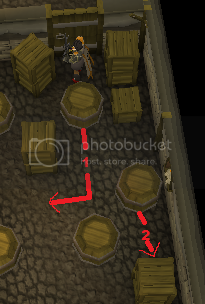 For this step you'll need a pickaxe, so make sure you have one handy. Go to the Rusty Anchor Pub and talk with the Bartender to gain access to his cellar. Search the random piles of junk of the floor to find the key to the cellar. Enter the trap door in the north east corner. You'll then use your pickaxe on a crack in the wall, and strange goo begins to seep from the wall and Jessika asks you to fetch an empty barrel from the room next to you. Once you've completed the puzzle and the barrel is with Jessika, blow your whistle to reset, and exit the room. Talk with the bartender and either tell him the truth or make up a lie about what is going on, and then head back to Korassi on the dock. Korasi will make the link between the bartender and Captain Tobias' behaviour. Jessika points out the pest will have looked for a similar climate to its home. All of this points to Musa Point (east of Brimhaven) as the pest's next location. Take a boat there and Korasi will tell you to speak to the inhabitants. Head to the general store and speak to shopkeeper Kofi who has some information. He refuses to help you until his shop wall is repaired so grab the supplies from the table in the shop and chisel the plank and log. Use them on each other to form a wall joist, which can be used on the damaged portion of the wall outside. Speak to Kofi again. He takes you to a place just outside his store, near a pond and will reveal mroe tracks for you to follow. Go inside the plantation and search the log in the south-west corner to reveal a mound. Inspect the mound, Korasi and Jessika will appear and ask you to look for clues around the mound. Inspect the mound a second time to find a material called waxwood. 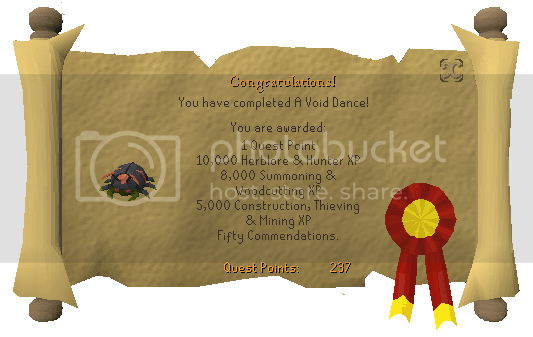 Show this to Jessika, who will tell you to speak to the crafting shop's owner in Rimmington. He will tell you that a large order was made of boxes with waxwood to go to a Faldor way. Head over to the chemist's house nextdoor to the crafter, and talk to Korassi. Talk to the chemist to begin the puzzle, make sure you have 16 inventory spaces. The main aim of the puzzle is to keep everything in working condition. So when the heat goes up open the furnace vent. If the power goes up, apply the power break, and add the chemicals correctly as it states in the key. 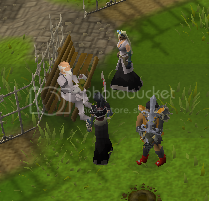 Once the puzzle is completed Jessika will teleport you to Falador where you talk with Sir Tiffy. He'll tell you about a box seller who you should go and talk to him who is located by the east bank.Buy a box, and attempt to investigate it and return to Korassi.All four of you try to open the box, but to no avail. Choose one of the options, however Korassi will interupt and smash it with her sword. You find the box contains pest goo, and you've been told to put some pressure on Ali Tist to find out where the boxes of his have come from.Talk to Ali Tist, and he will refuse to tell you where they came from and what is inside the boxes. Go back to Sir Tiffy Cashien, and he will direct you to Sir Amik Varze in the second floor of the White Knight's Castle (go through the door to the west and take the staircases upwards). You will explain the situation and he will write you a Search warrant to search Ali Tist's boxes. Go back to Ali Tist and say that you will examine his stock. He will tell you that a mysterious clue scroll was given to him that led him to a cave filled with the boxes that he was selling. Take this to Sir Tiffy Cashien, and they will let you follow the trail as well as give you a Commorb. Bring a Spade, Sextant, Watch and Chart with you before you start. 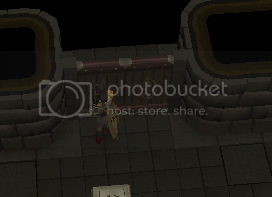 The first clue takes you just west of Falador by the mines. Dig by the hollow tree to find your next clue. It tells you to give a Man an onion as well as wave at him. Go south of the Crafting guild to pick an onion if you haven't got one already, and find the Man with the rucksack and stick who is east of the guild. Use an Onion with him and choose to wave (through dialogue). 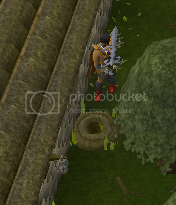 Your next clue will take you to the farmhouse south of Falador. 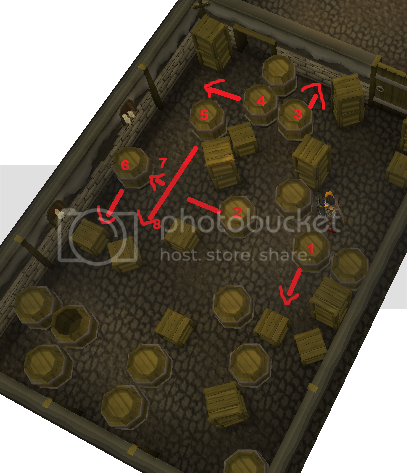 Search the crate in the main room to find another clue, which tells you to dig over some red flowers, north of the north-east fountain in the Monastery (Prayer Guild). 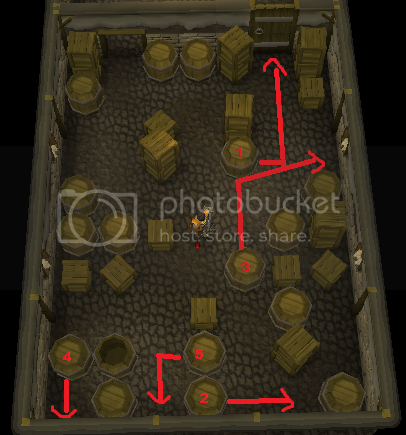 Your final clue is a set of co-ordinates which lead you to a hatchway north of the Black Knight's Fortress. Go straight there, remembering your Sextant, Watch, Chart, and Mysterious clue scroll, and choose to enter the hatchway. Korasi and Jessika will teleport to you to assist you. Korassi will come to help you open the hatchway. Once you enter talk to Korassu and she will kill the first guard that you see. Talk to her again and she will try to decieve the doorkeeper to let her through. She will fail, however she will discover that you need a password to get through. Talk to Jessika who will come up with a plan of summoning a tiny void creature. The creature will appear in your inventory, you must use it on the small boxes near the door. Once one of the workers enters you need to retirve the creature and take it back to Jessika who will tell you the password. She then tries to get through but finds you need some sort of identification. Pickpocket the worker that is carrying the bozes as he leaves to obtain your I.D. Enter the door yourself and you will succeed with Korassi and Jessika following behind. Once you've chosen the fate of the dorrkeeper move onto the next room. Search the north-west workbench to retrieve a tool, which can be used on the south-west workbench to retrieve a metal strip. Search the north-west workbench again to retrieve another tool, which can be used with the south-east workbench to obtain a hook. Use the metal strip and hook together to make a gaff. 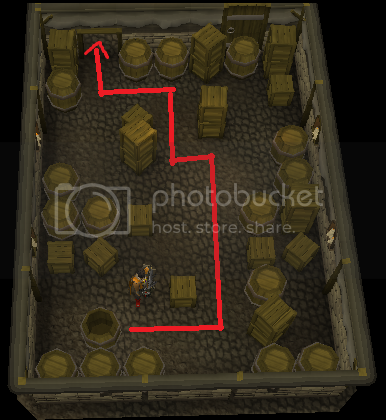 Either use the gaff with the shelf in the north-west corner to obtain the key. Now you must fight a black guard level 110. He will feed off your prayer, so it is recommended to drain your prayer before the fight. After you have killed him, you will notice the machine which is attached to the pest. Talk to the pest, and after a short bit of talking, either choose the option 'enough of this' and put the pest to rest, or set the pest free. The outcome is not affected by your choice. 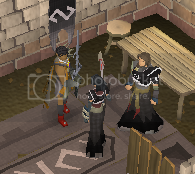 Leave with Korasi and Jessika to the Void Knights' Outpost, where you can talk to Commondore Tyr to finish the quest.